Laser engraving is a trendy method of personalizing, marking, etching, and cutting on almost any material, including metal, wood, acrylic, stone, ceramic, plastic, and glass to name a few. You might be surprised to know that laser engraving has become popular in the gardening arena. 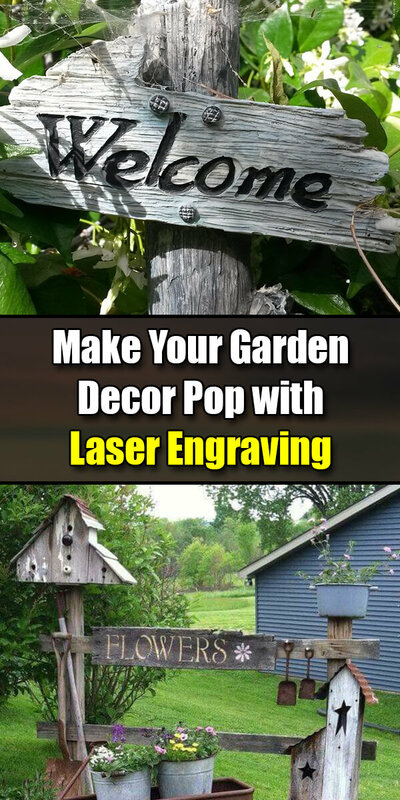 Whether people have it done at a laser engraving business, or they have their own laser engraving machine to do it themselves, there are several ways to upgrade, personalize, and decorate your home garden. Regardless of what type of garden you grow, laser engraving and etching will make it better. Plant markers are used to identify plants, vegetables, flowers, herbs, etc. in your garden. Garden plant markers come in a variety of sizes, materials, and types. For instance, if you have a potted plant or small indoor garden, small, acrylic markers are most often used. Where vegetables, flowers, or other plants are planted in the ground, ground markers made from ceramic tiles, stone, or glass are common. You can use laser engraving technology to create any kind of plant marker for your garden. Terra cotta planters are a common garden essential. They look rather plain and ordinary unless you engrave something on them. You can use laser engraving to identify the plant in the planter, engrave an image of the plant, or decorate the terra cotta planter however you please with a laser engraving machine. It spruces up your planters and gives your patio, outdoor, or indoor garden area a whole new decorative element. With a little computer graphics knowledge and the right laser engraving machine, you’re only limited by your imagination. Some people have large backyard gardens where they create a garden oasis of different types of plants. People use signage in a decorative and functional way to identify their various gardens. Butterfly gardens have specific plants and flowers that attract butterflies. Different types of flowering plants attract different types of butterflies. Bee gardens attract bees, which is important to the food chain. Vegetable gardens feed your family and are a sustainable way to save money over buying vegetables. Herb gardens are perfect for growing herbs for cooking and medicinal purposes. Those are just a few garden types you can grow in your backyard. You can create a laser engraved design to match your garden(s) and decorate your garden to make it more efficient and attractive. Finally, your gardening tools can be engraved. Why laser engrave gardening tools? Identification – If you and someone else in your house tend to gardens, you might want to engrave your initials, your name, or your nickname on them to personalize your tools. Function – You might decide to engrave the tool’s purpose on it just in case someone else decides to use your gardening tools and you don’t want them to be misused. It doesn’t matter why you use laser engraving to engrave what you want on gardening tools. The fact that you can do it is enough to give you inspiration to do it. Now you know how laser engraving can make your gardening experience more organized, functional, and pleasurable. Have you ever considered a home, tabletop laser engraving machine for your workshop?